More than 6,500 delegates enjoyed a comprehensive programme of education, expertise and peer engagement. Practical sessions were introduced to spearhead a drive toward diversified learning and the clinical research stream had a strong focus on nurturing new talent. Ethical issues and the impact of legislation on the profession were discussed in the popular Big Issues stream, and vets and nurses were able to engage interactively in more lectures thanks to the expanding use of ‘turning point’ technology. The ‘exhibitor village’ in the newly refurbished Barclaycard Arena saw the launch of new brands, products, systems and services, as well as a host of exclusive offers and special deals. It was impressive to see how exhibitors found creative ways to interact, for example the IDEXX lecture stream, Hills’ concourse coffee and Wi-Fi hotspot and the BCF Technology climbing wall. It seemed that every aisle was filled with exhibitors keen to find the most innovative and enticing way to show off their business and engage with delegates. Double Olympian James Cracknell gave this year’s keynote address, discussing the importance of ambition, determination and goal-setting, as well as his drive to increase childhood activity to tackle obesity. The social agenda was given a fresh approach this year too – with an ambitious seven-course taster menu at the banquet on Friday and the arrival of VetFest on Saturday. VetFest combined comedy, live music and great food with interactive stalls, a silent disco and lots of great little touches that created a fantastic festival vibe and some magnificent memories. The first cohort of around 30 vets to complete the BSAVA’s Postgraduate Certificates (PGCert) in small animal medicine and surgery enjoyed a proud ceremony and were presented their awards by out-going president Katie McConnell. The BSAVA Awards honoured the profession’s outstanding individuals, who help advance scientific knowledge and improve animal welfare. The BSAVA Balcony in the Barclaycard Arena was abuzz with bookworms seeking out new manuals. Thousands of books flew off the shelves - the two best-selling titles were both brand new books – Canine and Feline Ophthalmology and BSAVA Small Animal Formulary: 9th Edition Part B Exotic Pets. Just over 1,000 BSAVA members collected their free copy of the exotic formulary, posters and USBs as a thank you for being loyal members. Incoming BSAVA President Trish Colville, who abseiled down the side of the ICC to support PetSavers, said she was proud of the BSAVA’s achievements and honoured to be building on those in the coming year. “This Congress has been absolutely fantastic, there has been a really positive buzz at both the ICC and in the arena, and I would like to congratulate everybody involved for making it such a success. 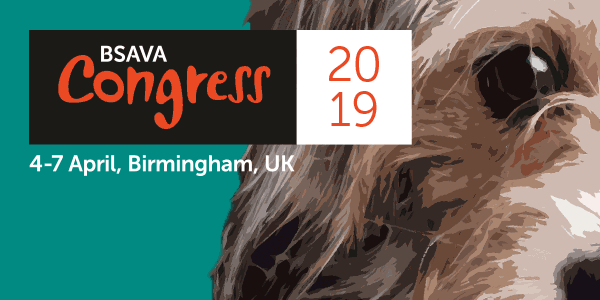 Congress is the flagship BSAVA event and more importantly the place where the whole profession comes together . Congress Programme Chair Nick Bexfield personifies the BSAVA’s ethos of ‘by the profession, for the profession’ and he welcomes input from colleagues from across the profession. He is always looking to the future, and with much of the programme already planned for 2016 (and with planning soon to start on Congress 2017), you too can send your ideas and comments to congress@bsava.com.